Virtually everything about the way people live and do business is changing faster than ever before. Digital technology, global development, urbanization, and business disruption represent both a major opportunity and a threat in the global economy. Although individuals and organizations are aware that the world is changing exponentially, most are ill-equipped to face this level of disruption and volatility. The Disruptors' Feast is a unique look into the trends that are shaping the world of the future, and a guide on how to avoid being eaten alive. Frits van Paasschen is a seasoned global executive whose work has brought him to more than 100 countries. In The Disruptors' Feast, van Paasschen takes readers on a literary journey to far-flung places around the globe to uncover the forces that are disrupting the status quo and driving change. His travel experiences illustrate how the stage is being set for even greater disruption, and what individuals and organizations can do to prepare for change and stay relevant in a tumultuous environment. This book isn't about the end of an era, but the end of eras. People have everything to gain or lose in how they deal with what is coming, regardless of their location, industry, profession, or aspirations. van Paasschen's unique insight offers a fresh perspective that is dearly needed in business today. 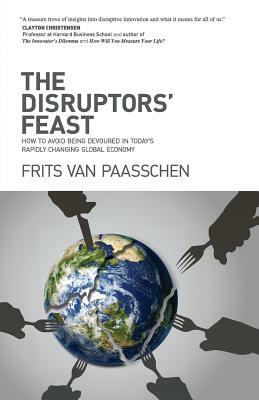 Frits van Paasschen is a seasoned global executive and the author of The Disruptors' Feast. His thirty years of experience inside global companies has afforded him a unique perspective on the current trends that are impacting business around the world. Frits shares his deep understanding of the forces that are disrupting the status quo to help businesses evolve and thrive in changing environments. Frits served as CEO of Starwood Hotels and Resorts from 2007-2015. Before that, he spent three years as CEO at Coors Brewing Company. Frits also held several management positions at Nike, ultimately becoming Nike's President of Europe, Middle East, and Africa. Prior to working for Nike, he worked in finance in Disney's Consumer Products Division. While Frits has a long history of executive roles, his career began in management consulting. At The Boston Consulting Group and McKinsey & Company, he primarily served retail and consumer clients. Advising on strategic direction is a passion of Frits' and he has served on a variety of boards throughout his career. He has been a Non-Executive Director at Barclays (FTSE) and as a member of the board of Directors of two NYSE-listed companies, Jones Apparel and Oakley. While at Nike, Frits served as Chairman of the European-American Industrial Council, and he later served on the boards of the U.S.-India and U.S.-China business councils. For several years, he was a member of the board of the Center for Environmental Leadership in Business at Conservation International. Frits holds a BA in Economics and Biology from Amherst College and an MBA from Harvard Business School. At Harvard, he was also a Teaching Fellow in Economics. Originally from the Netherlands, Frits holds dual U.S. and Dutch citizenship. A passionate traveler, he speaks five languages and has visited more than 110 countries. In his free time, he enjoys endurance sports, including marathons and triathlons. He has been married 25 years and has three children.